They use and deal with quality products. The people who you will be working with are very knowledgeable, courteous and trustworthy. They work with you in every way as far as cost, product, selection, and installation. Everyone they use from the carpenter, plumber, and electrician are fully qualified and professional. They Never leave the project without total cleaning up, and all of the work is done to your satisfaction. I would and have recommended their company to all of our friends. We cannot thank you enough. The kitchen is great, but even more important; the service that you provide has gone way beyond the call of duty. 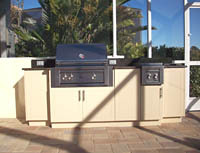 Thanks again and Roz and I would always recommend Elite Outdoor Kitchens and Design. 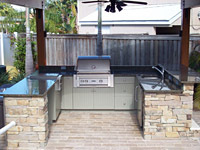 Dear Elite Outdoor Kitchen, thank you so much for the wonderful job you did on our outdoor kitchen. I appreciated the opportunity to come to your showroom to see your cabinets and the components I could choose from. We were not here for the actual construction of the kitchen, but our friend Ed, was. He was very impressed with the quality of workmanship that took place. He said the attention to detail is what impressed him the most. What a wonderful surprise when we finally made it back to FL and saw our finished outdoor kitchen. It is beautiful, complete and Dave thoroughly enjoyed his space. Working with Rita Pogany of Elite Outdoor Kitchen was a real pleasure. She and her staff always went out of their way to best meet our needs when designing then building our beautiful outdoor kitchen. A lot of suppliers talk about a partnership between builder and customer, but Elite Outdoor Kitchen and Design really follows through on that commitment. Hi Rita and Chuck, thank you for fitting our outdoor kitchen, we are enjoying it so much despite this cold spell. You helped so much with the planning and design and then completed the work professionally in a clean and timely manner. We researched outdoor kitchen companies for 6 – 9 months before selecting Elite Outdoor Kitchens to build ours. We are so glad that we did. Chuck, Rita and Lee were quite pleasant to work with. They were creative with their designs and flexible in meeting our needs, both in terms of design, function and time horizon. We would highly recommend their company to anyone who is looking for a high quality product installed with high tough service. Or Call us for a FREE Consultation!